The fatigue of titanium refers to the lowering of strength or failure of a titanium material due to repetitive/ cyclic stress which may be above or below the yield strength. The titanium material refers to commercially pure (unalloyed) titanium or titanium alloys used for structural purpose. Titanium materials can be used for structural applications due to outstanding corrosion resistance to various chlorides and oxidizing media, exceptional biocompatibility, and its high strength-to-weight ratio which improves the structural efficiency greatly. Thus, titanium and its alloys find extensive use in chemical and petrochemical industry, power engineering, biomedical implants, and aviation & aerospace industry, etc. During these applications, titanium structures are often exposed to fatigue loading. 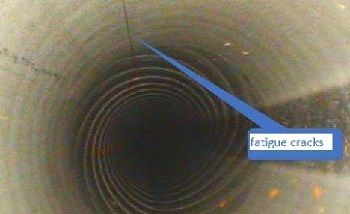 A fatigue loading is the fluctuating or repetitive stresses and strains which may cause localized permanent structural change at some point or points. It initiates tiny cracks which propagate and may cause catastrophic rupture finally. The fatigue failure of titanium and its alloys typically occur in three stages. First, a tiny crack initiates or nucleates often at a time well after cyclic loading begins. The microcracks are normally located at or near the surface, where the stress is at a maximum. Surface defects such as pits or scratches may accelerate the nucleation. Next, the crack gradually propagates as the load continues to cycle. Finally, a sudden fracture of the titanium material occurs when the remaining cross-section of the material is too small to surport the applied load. The fatigue failure occurs because even though the overall applied stress may remain below the yield strength, at a local length scale, the stress intensity exceeds the tensile strength of the titanium. 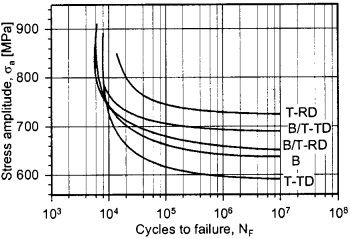 Generally, the lifetime of a titanium component that is subjected to fatigue loading can be divided into two segments: crack initiation (Ni) and crack propagation (Np). The S-N fatigue curve of Grade 5 titanium alloy Ti-6Al-4V. Microstructure: Several parameters possibly having an influence on the fatigue life of titanium structural materials include grain size, phase dimensions, morphology, age hardening conditions, degree of working hardening, elastic constants, and crystallographic texure. The materials cover commercially pure titanium, α-phase titanium alloys, near-α and α+β phase titanium alloys, β-phase titanium alloys. Crystallographic Texture: The anisotropic or isotropic mechanical properties of various titanium alloys are attribued to different crystal structures. It has considerable influence on the fatigue behaviours. Mean Stress: The mean stress affect the fatigue S-N curve significantly. In case of high stress amplitudes, the titanium may be subjected to low-cycle fatigue failure. While the stress amplitudes decrease significantly, the material may be subjected to high-cycle fatigue failure. As the mean stress increases, the stress amplitude must decrease in order for the material to withstand the applied fatigue stress. Mechnical Surface Treatments: Shot peening, mechanical polishig, or deep rolling can improve the fatigue life of titanium components. Thermalmechanical Surface Treatments: it improves the fatigue life by modifying the near-surface structure of titanium which increases the resistance to crack initiation in the surface. Titanium aluminides or titanium-matrix composites formed may also affect the fatigue behavior to some extent. Prev: How to Distinguish Unalloyed Titanium?